Q: is this the filter for LG lfx25976ST? A: I don't know and I'm not at home to look at the filter. A: The "2006B" is Identical to the 5231JA2006A, but removes more contaminants. Q: do you also have a LT120F filter? A: I have no idea. I just shipped a 2-lb parcel Priority Mail to Israel and it cost $36. A: Shipping costs are calculated at the time of Checkout process. It depends on the location and what items and quantities are being purchased. Please note that you have not officially placed your order at this point. At this stage of the Checkout process, you will merely be finding out what your total order costs would be. It is not until you enter your method of payment and the payment is processed, that the order is officially placed. A: It's the one that fits my fridge!!! Love the service I've received from WaterFilters Fast!! A: The right product at a good price, fare shipping. A: It's what my refrigerator needs and I couldn't find a cheaper brand. A: I recently purchased a new LG refrigerator -- LG LFX28979ST model. A: My filter needs to be changed. A: Lowest price for filter that I've found. A: this is a product I have to have for my refrigerator. I have never had a problem with this filter. This company has very reasonable pricing and shipping, and the product arrives very quickly, so I always purchase from waterfiltersfast. A: Its the filter that fits my refrigerator and could not find it at the store where I purchased it. A: cheaper than anywhere else! A: Factory replacement filter. Best price on the internet. A: After a lot of online research, reading the ratings, and this being a Trusted Store...I was sold. A: Great quality product. Fast Delivery and reasonably priced. Q: my filter number reads : 5231JA20006 will 5231JA2006A fit?/work ? Q: Lfx28978st/02 lg frig. Filter lt700p came with frig. What are all options? A: I think the LT700P is the one you want. This filter is for somewhat older LG models (although the refrigerators look similar, the filters are different). This was works great for my LG LMX25981ST model with French Doors. Q: Is this the same as the LG LT600P 5231JA2006B Refrigerator Water Filter...with a "2006B" not "2006A"? 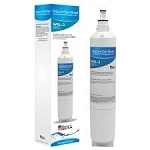 Q: THIS WATER FILTER YOU SELLING IS IT BREND NEW OR REFERB ? A: I believe it is new. The filter came in original packaging. Q: shipping to israel cost?